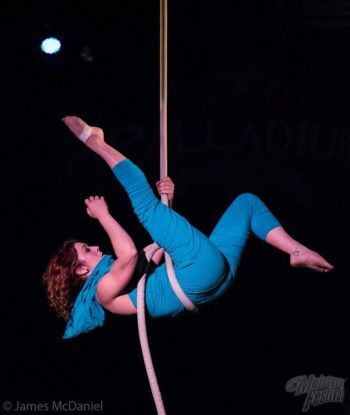 PJ has been multi-disciplinary aerialist since 2008, specializing in corde lisse since 2013. She loves the simplicity of this apparatus and thrives on chasing momentum. She currently lives in Bellingham, Washington, and coaches rope and handstands at Versatile Arts in Seattle. Her background is in biomechanics and kinesiology. PJ has performed with the Aerialistas, Bellingham Circus Guild, the Dream Science Circus, Moisture Festival, Apogee Aerial Dance Festival, Southern Fried Circus Festival, Vashon Open Air Festival, Denver Aerial Arts Festival, Vancouver Circus Festival and in Stuttgart, Germany, at the Friedrichsbau Variete. She most recently returned from the Western Australian Circus Festival, where she was invited to not only coach in the Lunar Circus Summer School, but perform solo and duo (with Dream Frohe) in the festival. After Moisture Festival, she is off to France to gain some more insight as an aerial coach.